How do I use the Rewards Points Program? The rewards points program allows you to offer points per dollar spent on your store to your customers records. The customer can then redeem the points for additional products at your store. This tutorial will give you a step by step process on how to setup and maintain your rewards points program. This article contains the following sections. Please click on a link to see its respective topic. Using the search bar at the top, search for the "Reward Points for Customers" module to bring it up. This setting will enable points to be accrued for Phone Orders as well. Specify which order status the order must be in before the reward points are enabled. For example, if you set this to "Shipped" status, then the customer will not get their reward points until the order is physically moved to shipped status. Mark this checkbox if you would like to set an expiration period for awarded reward points. If using the rewards expiration setting described above, set the number of days until the reward points expire here. Mark this checkbox if you would like to send an automatic notification message to your customers that their reward points are about to expire. If using the email notification setting mentioned above, set the number of days - before expiration - when you'd like to have the email go out. Place a mark in the "Enable Rewards" checkbox. Click Save Changes on the Module page and your store's Rewards Program will be active. Once the module is enabled, your product listing pages will display how many points customers will accrue when purchasing the item. Each product must be manually set as redeemable for the rewards program by specifying how many points are required to redeem the items. To perform this function, use the following steps. In the Rewards Options section, set the amount of points that the product will be redeemable for. For example, if the customer must accrue a total of 100 points in order to redeem the product, set 100 in the Redeem Points field. By default, all products will have a 0 as the default redeem points value. This means that products cannot be redeemable until actual redeem points are specified for the item(s). Redeem points can also be set via CSV import as needed. Please see the Rewards Program CSV header section of this article for more information. You may have some products that you do not wish to have involved in the rewards program at all. Therefore, we have made it so that you can also selectively disable rewards on individual products. This will prevent the item from accruing points for customers when they purchase the item. In the Rewards Options section, place a mark in the checkbox labeled "Disable Rewards" to prevent the item from accruing points. 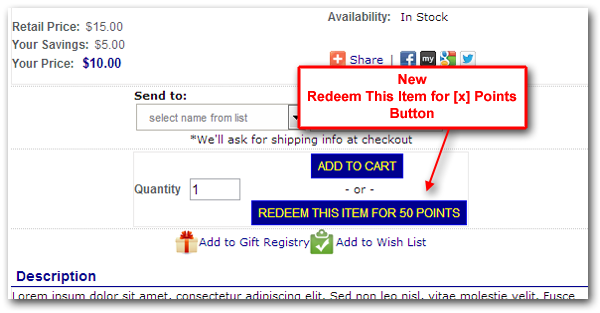 In the example above, the item will not accrue points, but it can still be redeemed for points. The Disable Rewards checkbox merely prevents points from being accrued on the item, but does not specifically prevent the item from being redeemed with points. If you would like the product to also not be available for redeeming, leave its Redeem Points field at 0. You also have the ability to specify custom reward points for a product which will override the default rewards multiplier set in the Store Modules page. This can be useful if you'd like to specifically dictate the number of points awarded to purchasers of the product, regardless of how much money is spent on the order. For example, rather than awarding 50 points for $50 item, you can customize things so that the item accrues only 15 points. In the Rewards Options section, set the Custom points to whatever you'd like the product to have as its reward oferring. Regardless of the dollar amount spent on the product, its rewards points will reflect the custom points instead. If the custom points field is set back to the default 0, then the product will accrue the amount based on the Rewards Multiplier* specified in the Store Modules page. Please take special note of the way custom reward points on the individual product level will work when it comes to the global multiplier and discounts. As mentioned earlier, the global points multiplier will allow you to multiply the amount of points awarded to a customer per dollar spent. However, it is important to note that the global multiplier is also used to deduct discounts when calculating Reward Points after discounted dollar amounts are applied. This is to ensure that the customer is awarded the proper points based on the amount they spent. In other words, let's say the multiplier is set to the default 1 to 1 ratio; the item/order is $100, but the customer was given a $20 discount, so they only paid $80. Therefore, they are awarded 80 rewards points. This can yield seemingly unexpected results when using custom reward points because the multiplier is also being used to calculate the amount of custom points awarded to the customer. 10 points are awarded instead of the 20 custom points. $20 off, multiplied by 0.5 = 10 points deducted from rewards. $20 off, multiplied by 1 = 20 points deducted from rewards. 20 points deducted from 20 custom points = 0 points. $20 off, multiplied by 1.5 = 30 points deducted from rewards. 30 points deducted from 20 custom points = (-10) points, i.e. 0. $20 off, multiplied by 2 = 40 points deducted from rewards. 40 points deducted from 20 custom points = (-20) points, i.e. 0. Therefore, if you plan on using custom reward points for your products, we recommend setting the global multiplier in the store modules area to 0 to help avoid these types of problems with custom reward points. Product Reward point settings and amounts can be imported to your store via CSV import. The following CSV Column Headers will be needed in the import file to add reward point details to your products. Sets the number of reward points needed in order to redeem the item. Sets whether the product has Rewards disabled or not. This is a toggle variable so 0 for off an 1 for on to disable rewards. Normally reward points will be accrued by your customers as they spend money on your store. However, you can also manually award points to individual customer records as needed. You will be presented with the customer's accrued rewards points as well as links directly to orders in which they accrued said points. Towards the bottom of the page, you will see two open text fields labeled "Points:" and "Reference:" respectively. In the "Points" field enter the number of points you'd like to award the customer. In the "Reference" field, enter a note specifying what the rewards points were for. Click Insert Points to add them to the customer's record. Merchants can now prevent individual customer groups from accruing Rewards Points. This can be useful to prevent wholesale shoppers (who typically purchase in bulk and at a discount) from being able to use points to redeem additional items from the store. Place a mark in the checkbox labeled "Disable Reward Points"
Users in this customer group will now be prevented from accruing Reward Points on their purchases. Merchants can also create a promotion that awards bonus reward points to their customers. Here, we will show you how to create a basic bonus reward points promotion. For more information on creating promotions, please review our Promotion Manager Guides located here and here. This will be the promotion's display name. The promotion will apply automatically when applicable to the customer's cart. The promotion will only apply when the customer inputs a coupon code in the shopping cart. The text box next to Coupon Promotion is where the code will be configured by you. The amount of discount the promotion will apply to the customer's cart. This can be specified as either a dollar amount, or a percentage. When these fields are populated, save the promotion. Upon saving the promotion, the Promotion Manager interface will display additional settings for the promotion. When first creating the promotion however, the interface will advise you that the promotion is not yet enabled (along with a link to enable the promotion). It is recommended to specify your additional settings before enabling the promotion. For the purposes of this article, we will create a Promotion that will automatically trigger when a shopper places $500 or more in their cart. The promotion will then add an extra 100 bonus reward points to their customer record. Feel free to tailor these instructions to meet your needs. Now click on the "Advanced" button located next to "Promotion Offers"
Scroll down to the very bottom of the page where you will see "Bonus Reward Points:"
Enter the amount of reward points you'd like to award recipients of this promotion and click save at the top right of the page. With the promotion settings configured above, your shoppers will get the promotion automatically applied to their cart when they purchase $500 or more worth of product. Furthermore, your customers will see the bonus reward points when they log into their My Account page to view their Reward Points balance. The bonus rewards will reflect the name of the promotion used at the time of purchase. Your customers can also use this section of the My Account Page to redeem products using their rewards. By enabling the Rewards Point Program on your store, your customers will now see a Purchase with Reward Points option on your listing pages along with the regular "Add to Cart" button. Also introduced on Version 6 of the 3dcart Software is a new SmartList for marketing newsletters that will auto-populate a newsletter list with customers who have a remaining balance of accrued Reward Points. More information on SmartLists can be found by clicking here. Click on the "Actions" button at the top right and select "SmartLists"
Now click on the "Advanced" button to see the SmartList's SQL statement. Our default Smartlist is set up to create a newsletter recipient list for any customers which have a number of reward points greater than 0. Smartlist of Customers with less than 0 reward points. This can be used to reach out to customers who have not accrued any points yet. Introduce them to your rewards program and get them to accrue points by buying your products! Smartlist of Customers with over 50 points. Use this smartlist to reach out to customers who have over a specific amount of rewards points and entice them to re-visit your store. You also have the ability to award points for specific events like registering as a new customer, signing up for newsletters and more! Enter the number of points a user will get for referring shoppers to your store. This can be used in conjunction with a promotion enticing anyone that they refer to purchase from your store. The store will generate a link directly to your store customized to the referring user (*See "Reward Referral Popup Text" section below). This way, they can share the URL with others and receive this number of points for each person they refer who purchases from you. Enter the number of points a user will get for providing a review on a product of your store. When using the Referral Link custom point setting, users who are referred to the store will see a popup window notifying them who referred them and whatever actions (if any) they need to take to receive their promotional discount. The text of this pop-up can be written in the "Reward Referral Popup Text" field. Note that - should you elect to offer a promotion to the people who get referred to the store - you will also need to create the applicable promotion on the store in order for the user to receive their promised discounts. To the right of the custom reward settings, you will see a widget code that can be placed on your store to notify users of these offers. The widget will apper at the bottom of the page you place the code into and - when clicked upon - will generate a popup window instructing the user on how to receive the additional points. You may edit the widget's code as needed for customization - as well as restore it to its default should the need arise.